MINNEAPOLIS--(BUSINESS WIRE)--On September 20th, 2018, Premier Biotech Inc. was granted a 510(k) clearance from the Food and Drug Administration (FDA) for two additional oral fluid assays, Oxycodone and Methadone for their patented rapid oral fluid drug screen device OralTox®. 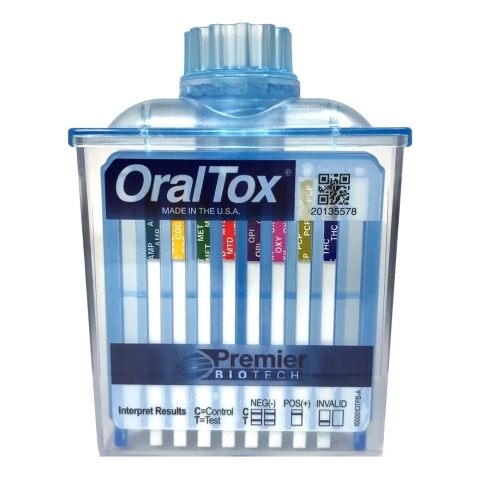 In total, OralTox® has 510(k) clearance for in vitro diagnostic use including point-of-care sites for the following 8 drugs: Amphetamine, Cocaine, Marijuana, Methadone, Methamphetamine, Opiates, Oxycodone and Phencyclidine. This clearance represents another landmark achievement that demonstrates the ongoing commitment of the company to invest in the design, development and commercialization of near-donor solutions for the toxicology market. The Minnesota-based company set the stage in February of 2018, with the clearance of the OralTox screening device for the legacy 6 drug panel. By design, the OralTox format can scale to simultaneously detect up to 12 drugs, so this clearance marks the beginning of the next phase where more assays will be validated and submitted to the FDA to fully utilize the capacity of the device. The use of oral fluid as a testing matrix offers numerous benefits over urine testing: the process is less invasive, the collection can be fully observed without privacy concerns, tests can be administered without the need for specialized collection facilities and, most significantly, is resistant to adulteration. Premier Biotech’s laboratory is uniquely positioned to offer LC-MS/MS confirmations of presumptive positive results as well as a comprehensive test panel with or without the OralTox front-end. Premier Biotech has extensive experience working with corporate workplace customers and government agencies to expedite their drug screening processes with fast, accurate drug tests. After rigorous precision, safety, and efficacy review, the FDA’s 510(k) clearance of OralTox enables the implementation of a rapid oral fluid drug test in the clinical market. OralTox is the only FDA-cleared, rapid oral fluid drug test to include an assay for Oxycodone and is capable of being sent to a lab for confirmation. OralTox can help medical professionals including treatment providers, behavioral health centers, and pain clinics test for illicit substance use and medication compliance. OralTox also equips corporations throughout the United States to make immediate hiring decisions and facilitates expedited client interactions in the criminal justice industry. Premier Biotech Inc. is a leading provider of rapid drug testing devices. The Chanhassen, MN, facility manufactures a comprehensive line of proprietary products. Premier Biotech Labs, LLC, located in Minneapolis, provides high complexity testing and customized laboratory services for toxicology testing in criminal justice/corrections, clinical medication monitoring; and corporate workforce clients. Premier Biotech Labs holds both CAP (College of American Pathologists) Forensic accreditation and Clinical Laboratory Improvement Amendments (CLIA) certification, each of which requires the highest level of quality control standards and rigorous protocol adherence, including complete chain of custody and frequent inspections. OralTox® Granted The First-Ever FDA Clearance For The Detection of Oxycodone in Oral Fluid. FDA-cleared for: AMP, COC, MET, MTD, OPI, OXY, PCP, THC.